Happy 145th anniversary to my great-great-great grandparents, Yehoshua Zev and Mira Lefand! Kind of. You know those relatives that you just can't find on a ship manifest? That you search for using wildcards and alternate spellings and every trick in the book--and they're just nowhere to be found? Well, those were my Joshowitzes. I knew that my great grandmother Esther Rutner Joshowitz came to America with my grandmother's oldest brother Izzy. They came at some point after WWI and at least nine months before my grandmother's birth in February 1922. I tried with just first names (lots and lots of Esthers and Esters came to the US in that time period). I tried with as many wildcards as Ancestry would allow. And nothing. I cursed transcribers who obviously couldn't read my great grandmother's name. I grumbled at the Ancestry programmers who put too many restrictions on wildcards in searches. And then I tried searching on Steve Morse's site. New Eizikovics Link--Or Maybe Not! Samuel Hers Eizikowitz kept popping up in my research. Since I had a great-great-great grandfather with this name, I suspected he was relatively closely related to me, but even with a pretty comprehensive Eisikovics tree, I couldn't fit him in. I knew he had gone to America--his daughter's birth record has his place of residence as "New York, America." And the award for going through the most difficulty to get a birth registered goes to....Eizik Fuchs, the brother of my great-great grandmother Rochel Fuchs Rutner! Eizik's journey to get his birth registered spanned an ocean and more than seven decades. When I started writing this post, I wasn't sure why he would have done such a thing, but in the course of writing this post, I figured it out! In 1913, Josef Joshowitz (my great grandfather) came to America, and he said he was joining his cousin "Eizig Fuchs" in New York. I knew of my family's Fuchs connection but was never sure how Eizig was related. Well, it's happened. My first instance of pedigree collapse. While I've seen examples in my family of cousins related in multiple ways, I had no examples of any of my direct ancestors appearing on my tree more than once. And then along came Avraham Vizel. Avraham Vizel was the father of Rechel Vizel Rutner, who was the mother of my great-great-great grandfather Mendel Rutner. Avraham lived in what is now Bilovartzi, Ukraine (and what was called Bilvaritz in Yiddish). 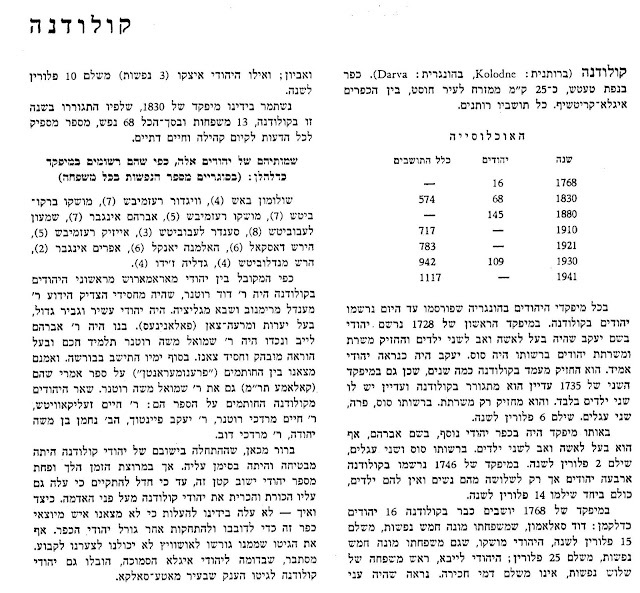 There's an entire section with his story in the Yizkor Book Sefer Maramaros which deserves (and will get) its own post. Recently, as I was doing research, I found another branch of Vizels to whom I was related. I had traced them back to the dual villages of Kis-Kirva and Nagy-Kirva. But “coincidentally,” the furthest back I traced them was to a man also named Avraham Vizel. So it looked like I had two 5th great grandfathers with the same name! Perhaps they were related? I checked to see how far apart they lived. 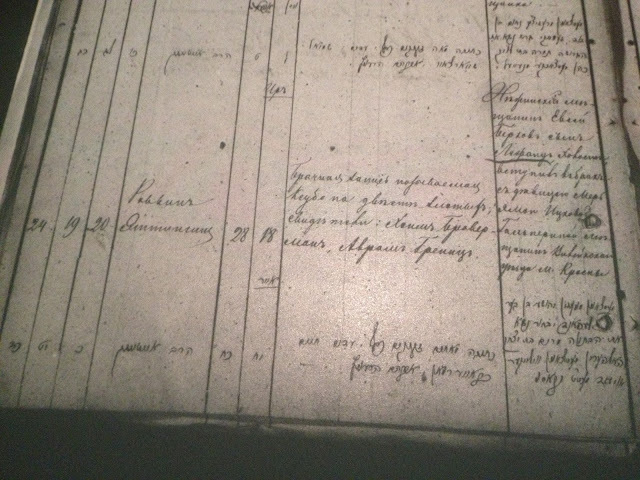 Some wonderful volunteers at JewishGen's Hungarian Special Interest Group (H-SIG) have transcribed and indexed Jewish entries from multiple different Hungarian censuses. And more are being added regularly. I recently learned some lessons about dealing with this data set that can help others with their research as well. 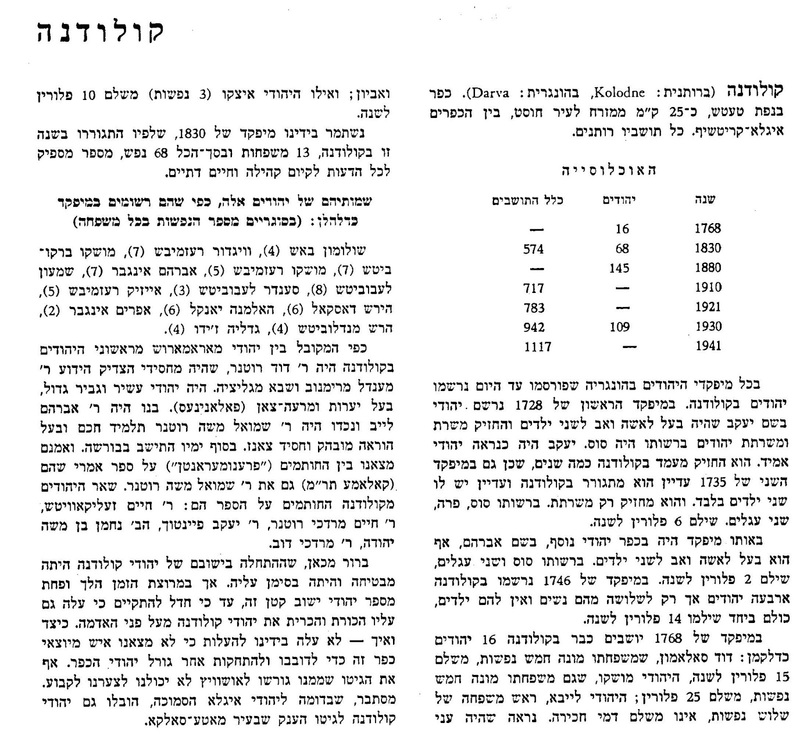 I've regularly searched for entries relating to my Rutner family from Darva (today's Kolodne). In under two months is the Ontario Genealogical Society's conference which--for the first time--has a Jewish Stream in cooperation with the Jewish Genealogical Society of Toronto. I'll be speaking along with Israel Pickholtz and Daniel Horowitz--plus there's access to all of the other OGS talks! In response to recent posts about how I'm related to people in multiple ways, and why this expression of Ashkenazi Jewish endogamy makes using DNA to find relationships among those with Jewish ancestry much more difficult, an adoptee asked how far off from how much shared DNA would be expected my known relatives were in order to help her understand her own matches better. We always hear about how much harder it is to use genetic genealogy to find relatives when you are from an endogamous background, and Ashkenazi Jews (AJs) are a typical example. AJs married within the small pool of AJs for centuries, so we are all related to one another in multiple ways. I've had enough relatives test to see how endogamy is reflected in practice. Around 1991, I found the book Sefer Maramaros, a Yizkor book commemorating the various Jewish towns of the Maramaros megye (province) of Austria-Hungary. There were articles about specific cities and towns, ranging from one to several pages each. I immediately looked up what was written about Kolodne. Israel Pickholtz begins this story here, examining how I seem to be related to a woman named Evelyne in multiple ways, per DNA. He has shown that both my paternal grandmother and grandfather were related to her, as is my mother. Now I'm going to pick up where he left off to look at various branches of my family and their relationship to Evelyne. Neither my mother's maternal aunt nor her maternal first cousin match Evelyne at all, so I initially concentrated on my mother's father's side. First I looked at descendants of my great-great-great grandmother, Mira Halperin Lefand Marienhoff. Tested descendants include my mother and uncle as well as cousins Ken, Myron and Sue-- descendants of three of Mira's other children. My family is descended from Pesha-Riva, Ken from Nechemia/Hamay, Myron from Meyer, and Sue from Nechama/Emma; Sue is also the only testee who descends from Mira's second husband. Ken, Myron and Sue are all one generation closer to Mira (great grandchildren) than are my mother and uncle. My uncle doesn't share any DNA with Evelyne. But looking at the other individuals shows matches--some relatively close. My mother and Evelyne also share 71cM over 21 segments and are predicted 5th-remote cousins. Chromosome 10 is very interesting. Both Myron and Ken share a (triangulating) relatively large 12cM segment with Evelyne. Hirsch Tolchinsky was the half brother of my great-great grandfather Hillel. He was born about 1869 to Shimon and Risha-Frayda (nee Melanitsky or Mechansky) Tolchinsky in what is now Nizhyn, Ukraine (and was then Nezhin, Russian Empire). 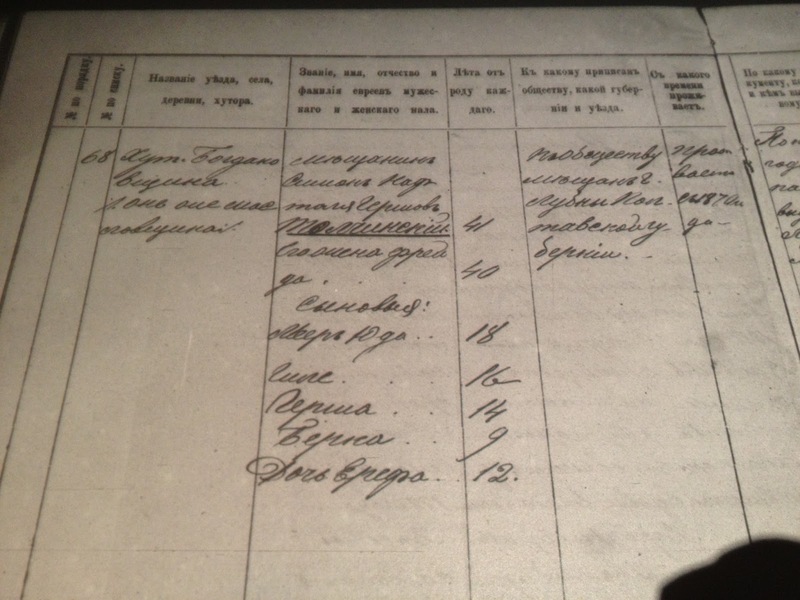 The earliest mention I have of Hirsch is in an 1882 Russian Empire Households list.